Since Since 1994, Predator has consistently turned out technologically superior cues that boast improved feedback, stability, accuracy and longevity. Each cue's precision and solid feel are the result of Predator's C4TM technology while the exotic wood designs give exceptional beauty to this killer on the table. Maybe that's why many of the top nation's ranked pros use Predator shafts to play their best games. One of the many keys to having consistent billiard success is selecting the right pool cue for your game. It is imperative that players have confidence in their cue, and that the cue fits their specific needs. 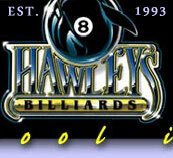 Hawley’s Billiards has helped multitudes of players select the perfect pool cue for their game. Not only do we offer an extensive selection of cues from the most reputable companies in the industry; we also offer custom pool cues for sale, ensuring our clients can own a cue tailored to their needs. One of the most popular brands that we carry is Predator. Predator billiard cues are renowned for utilizing innovative technologies that help players make more accurate shots. We have a variety of predator pool cues for sale, and have cues available that can fit any budget and skill level. Best of all, we can customize a Predator cue for you, ensuring that you will feel comfortable and confident while shooting pool. If you have any questions about our business, or would like help selecting a pool cue, please contact us. Our dedicated staff is comprised of serious pool players who have extensive product knowledge, and will be able to guide you in the right direction. Additionally, we offer a 30 day, no questions asked return policy, where you will receive a full refund. So please shop with confidence, and take advantage of our expertise! Introducing Panthera2-1 and Panthera 2-2, the long awaited sequel to the majestic Panthera special editions. Meticulously inlayed with exotic materials and paired with Predator’s world renowned low-deflection shafts, these cues are an extraordinary sight to behold. Performance is stepping up when the stakes are at their highest. It's trusting your equipment when you are competing under pressure. Enhancing your performance is what inspires Predator Group, drives their research, and defines their mission. The Ikon 2 Series of Predator cues has been discontinued, however, some still remain in inventory, so get these, now collectible, cues before they are gone forever.